Notes: Age-adjusted death rates were calculated by applying age-specific death rates to the 2000 U.S. standard population age distribution. Drug overdose deaths are identified using International Classification of Diseases, Tenth Revision underlying cause-of-death codes X40–X44, X60–X64, X85, and Y10–Y14. 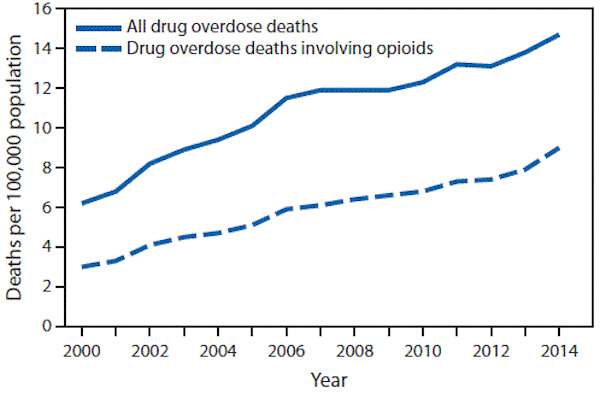 Drug overdose deaths involving opioids are drug overdose deaths with a multiple cause-of-death code of T40.0, T40.1, T40.2, T40.3, T40.4, or T40.6. Approximately one fifth of drug overdose deaths lack information on the specific drugs involved. Some of these deaths might involve opioids. Opioids include drugs such as morphine, oxycodone, hydrocodone, heroin, methadone, fentanyl, and tramadol. Data Source: National Vital Statistics System, Mortality file. This entry was posted in Medicine and Society Data Watch on January 27, 2016 by Genevra Pittman.